Tickets were only 160$ for 2 people. That’s one of the reasons why we chose this location. Day 1: Arrival at Ovda airport in the evening. 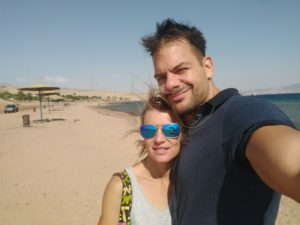 Pick up arranged ahead of time with a Hungarian couple living in Eilat who run a tour agency (paid 10$ for transport). Their website is Eilat.hu. 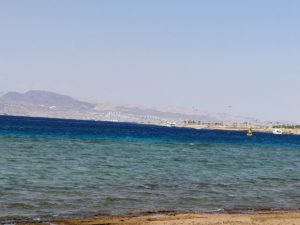 Ovda airport is a 40 min drive away from Eilat, there are taxis and buses cruising between the airport and the town. Accommodation: 60$ for first 2 nights in Eilat. Booked through Eilat.hu. They have a big family house and they rent out some of the rooms. Located 20 min on foot from city centre. 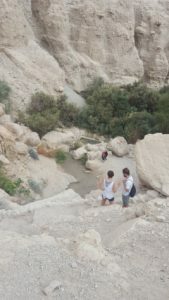 En Gedi: 2.5 hours’ drive from Eilat. 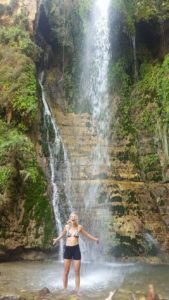 A nature reserve with waterfalls in the desert. Good for hiking, cooling off under the waterfalls. You can choose to do a full day hike, but we only did a shorter one that lasted about 2 hours. 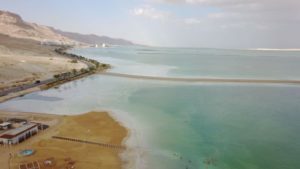 Dead Sea: 15 minutes’ drive from En Gedi. 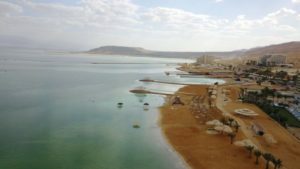 Floating in the Dead Sea had countless benefits, I will not list those here. Time spent: 2 hours. Be careful to only ‘swim’ on your back, don’t swim on your stomach. You can buy a packet of Dead sea mud and put it on your whole body, wash it off after 20 minutes. Your skin will feel 10 years younger. Lunch: We bought some bread, cheese and ham at the store near the Dead Sea. It cost us 25$ for 2 people. Visa to Israel: Most countries don’t need a visa to Israel, you get 90 days to spend in the country (you can leave the country and enter again multiple times within those 90 days). However, your passport needs to be valid for 6 months when you enter. 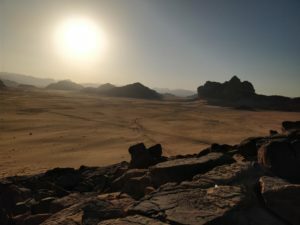 However, you need to pay 34$ exit fee if you cross the border to Jordan. They give you a small piece of paper as proof of entry, you don’t get a stamp in your passport at the Israeli border control. Means of transport: A 15 minute ride in a taxi from Eilat centre to the border costs about 12$. 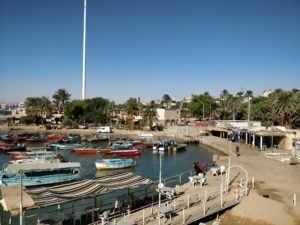 From the border on the Jordan side to Aqaba centre: it also takes about 15 minutes by car, taxis change around 10$. You can pay in dollars in of you don’t have dinars yet (the local currency). 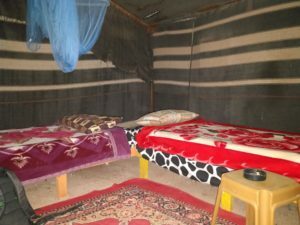 Visa to Jordan: If you are going to spend less than 24 hours in the country, you will need to pay $60 for visa, if you stay there overnight then the visa is free. 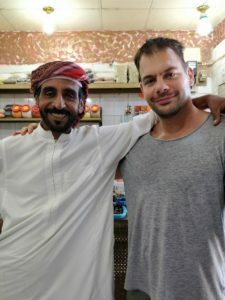 Consider getting the Jordan pass, it costs 70$, and it gives you a free visa, plus free entry to 40 different cultural sights in Jordan, including Petra. 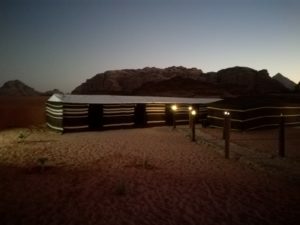 The one condition of the Jordan pass is that you need to spend at least 3 nights in the country. You don’t need to print it, just keep the mobile version on your phone. You can get it online at least one day before entering the country. Border crossing: Prepare for a long wait, it took us about 3 hours to get through waiting for one stamp after another. The room was basic but clean. The breakfast was included, a very simple meal of pita bread, hummus, olives and eggs plus coffee. 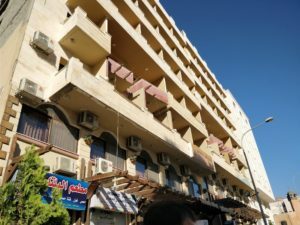 We got to Aqaba around 11am, we spent the day walking around. 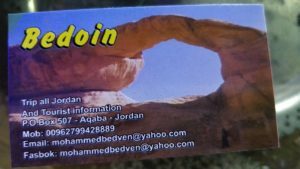 There is a museum and a castle in Aqaba (also on the Jordan pass tickets list) but they were both closed for renovation. They didn’t say when they will open again. Lunch: Pita and meat for 10$ (for the two of us) at a local restaurant. We noticed straight away that the prices are about half of Israel’s. Cost: 70$ for the taxi ride. 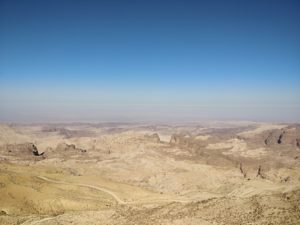 The drive from Aqaba to Petra takes about 2.5 hours. 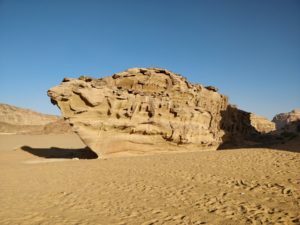 We left at 8am and returned to Aqaba at 5pm. 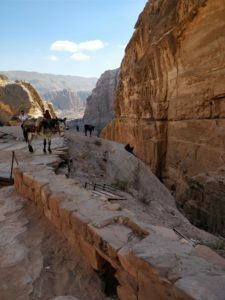 The entrance to Petra was 70$ but for us it was included in the Jordan pass. 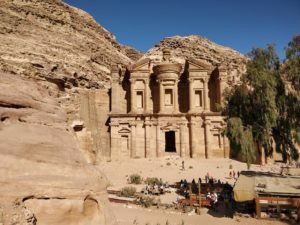 Time spent at Petra: We were there for 5 hours, which is the minimum time you’ll need to discover the place. Be prepared to do a lot of walking and climbing uphill. 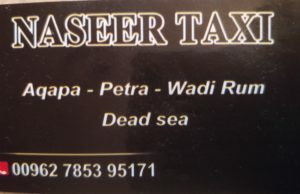 Our driver Naseer waited for us outside. Do you need a guide? 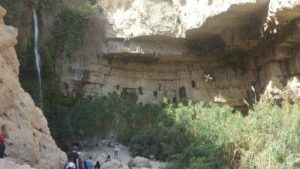 : We took a guided tour, it cost $50 and the guide was with us for 3 hours, telling us about the history of the place and what all the carvings in the walls meant. 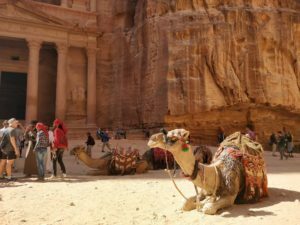 You can explore Petra without a guide and still learn a lot, but a guide will give you extra information you wouldn’t learn otherwise. Tip: Talk to people at the entrance and find someone who also wants a guided tour, this way you can split the cost. 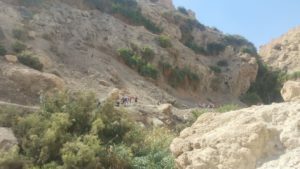 Lunch: There is a café at the end of the trail, further from the Treasury in Petra, where you can buy snacks and drinks. 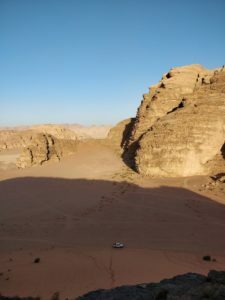 Day 5: An overnight trip to Wadi Rum, a valley in the desert, again arranged through Mohammed. 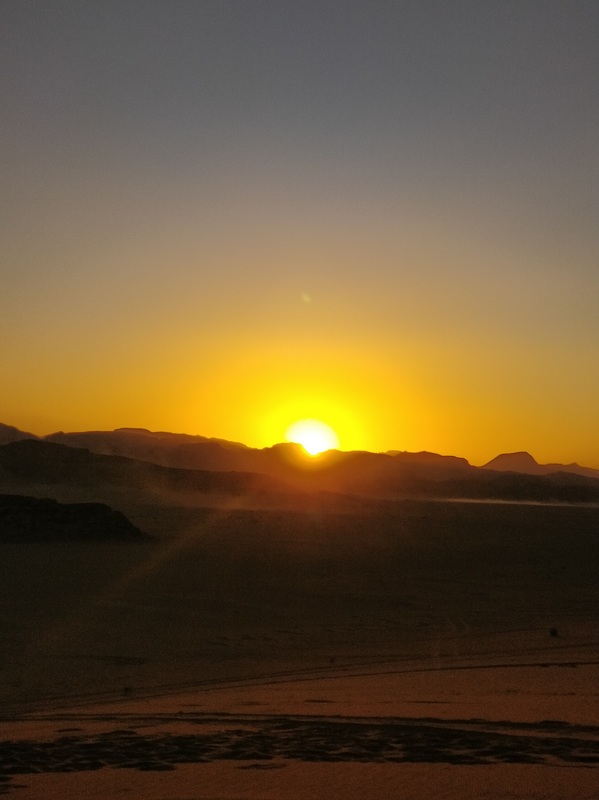 Program: The drive from Aqaba to Wadi Rum took about 50 minutes. First we went on the jeep tour through the desert, stopping at a few places to look around and take pictures. 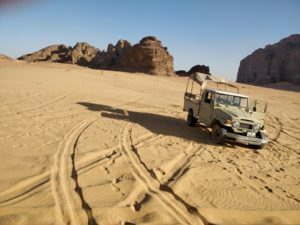 The jeep driver took us to the desert camp called Magic Rum. There we had a dinner of pita bread, meat, hummus and vegetables, relaxed and went to bed. 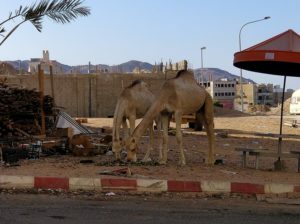 Day 6: In the morning Naseer picked us up and drove us to South Beach in Aqaba (we paid 15$ for the drive). We hang out there for a while, the beach is quite windy and the water is cold, but if you are up for it the snorkelling and diving is supposed to be great. Lunch: There are 3-4 restaurants not directly on the beach, but on the other side of the road, a 5 minute walk from the beach. We had some salad for lunch for about 10$ for the two of us together. 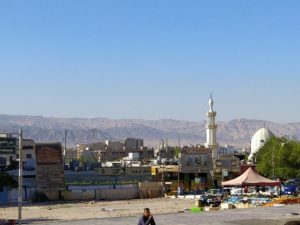 In the afternoon a taxi arranged through Mohammed took us back to the Israeli border (15$). We walked through the border, without any waiting this time and entered Israel again. Accommodation: We booked a room through Booking.com at the Sea Princess Motel. It was Friday night and probably that’s why there were very few places available and this basic room cost us 100$. So be careful and book ahead if you know you’re going to be spending Friday night in Eilat. Dinner: We bought some food at the local store and ate it at the hotel. We paid about 30$ for the food we had for dinner and breakfast the next day. Day 7: Flight back to Warsaw. Our transport to the airport was arranged through Eilat.hu again (10$). At the airport they asked us a few additional questions when they saw we went into Jordan, otherwise the border control is quite relaxed, you can even take liquids onto the plane (more than 100ml).